"JOYFUL LAMB ON BARN WOOD"
The pastures in our verdant valley are teaming with new life, young calves, spindly foals, and sweet lambs. This sweet painting was inspired by all the signs of Spring. He was painted on a piece of barn wood using acrylics. I can add a hanger, or you can lean this piece on a mantle or shelf. "JOYFUL LAMB ON BARN WOOD" is 15-inches at the peak, and is a tad over 5-inches wide. "JOYFUL LAMB ON BARN WOOD" is a One-Of-A-Kind hand-painted piece and will come signed and dated. All my pieces are created by me, Sheryl L. Parsons of Mother’s Dream Artworks. Thank you for supporting my love of creating! Price is $69.00 plus $10.00 Shipping via priority mail inside the US. This Bunny Diorama is a mixed media piece, using a vintage Jello mold, a hand crafted bunny, tiny pom trims, tinsel garland, acrylic paints, flocked flowers, and water color paper. I’ve attached a gold thread hanger to hang on a wall, or Easter tree, or wherever you want to display this. "BUNNY DIORAMA" is a one of a kind, hand-painted piece, and comes signed and dated. You are getting the original with a guarantee that was it created by me, Sheryl L. Parsons. Thank you for supporting my love of creating! Price is $45.00 plus 8.50 Shipping via priority mail for inside the U.S.
HUNNY BUNNY is a sweet bunny sculpt attached to a vintage jello mold that’s been hand painted. She comes all dressed up with ribbon, flowers, pearls and tinsel garland. Measurements: She Stands 6-inches tall and is 4-inches wide. "HUNNY BUNNY" is a One-Of-A-Kind hand-painted piece and will come signed and dated. 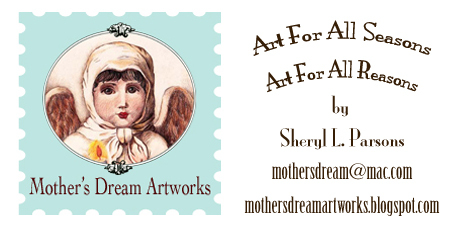 All my pieces are created by me, Sheryl L. Parsons of Mother’s Dream Artworks. Thank you for supporting my love of creating! Price is $84.00 plus 8.00 Shipping via priority mail inside the US.